IDW Publishing and Yoe Books have announced a new line of Marvel Comics collections, a sensational series of large-format hardcovers curating the finest artwork from the Golden Age’s four-color foundations all the way up to the Marvel Age’s dizzying heights! The world is now marking the 100th anniversary of the Armistice of World War I, “The War to End All Wars” that brought the cry, “Never Again!” Nearly four decades later, Never Again was a rare two-issue anti-war comic book with a host – a WWI doughboy referred to as The Unknown Soldier – who told gripping war stories with a strong anti-war stance. The comics from Never Again and other arcane historical comic book sources are carefully restored and showcased in an important new book, The Unknown Anti-War Comics. An action-oriented medium, comics have long used wars – real and fictional – as narrative fodder, often with a strong message attached. Buried in the comics published during the Cold War were powerful combat, fantasy, and sci-fi stories that strongly condemned war and nuclear weapons, boldly calling for peace. The Unknown Anti-War Comics features the art of Steve Ditko and leads off with two noteworthy introductions. The first introduction is a comic story created especially for the collection by Nate Powell, artist of the National Book Award-Winning March books about Civil Rights leader John Lewis. The second introduction is by Noel Paul Stookey, activist and singer/songwriter of Peter, Paul, and Mary fame. The 224-page book’s artful advocacy of peace is as important as ever in a world still embroiled in war. The Unknown Anti-War Comics is edited by Craig Yoe, multiple Eisner Award winner, Mobius winner, and recipient of the Gold Medal from the Society of Illustrators. Now available for pre-order via online booksellers and comic book specialty retailers, The Unknown Anti-War Comics is slated for release in January. Preview: Super Weird Heroes: Preposterous But True! Super Weird Heroes: Preposterous But True! Weirdness from A-Z! Airmale to The Zebra! Here’s a new tome crammed with OMG, WTH, and LOL bizarro heroes of the Golden Age. Eisner-winner Craig Yoe provides both witty and fascinating context to heroes like Mr. Whiskers (a young actor who dresses like an old geezer), Hip Knox (who has an eye-ball on his chest and what looks like a woo-woo on his belt), and Pat Parker War Nurse (who fights Nazis in a skimpy nurse/superhero costume)! Over 30 full comic stories in all! IDW Publishing and Yoe Books have announced Clyde, the all-new original graphic novel written and illustrated by Jim Benton, author of the New York Times-bestselling series Dear Dumb Diary. The hilarious and heartwarming story of a mischievous bear who believes that happiness can be found over on the rough side of town, Clyde reaffirms that there’s still room for family, friendship, and altruism in even the most rebellious among us. When Clyde the Bear decides to ditch his safe and peaceful life in Cubville and head off for the mean streets of Grizzly City, he learns – with the help of a reformed juvenile delinquent butterfly – that the Bad Life isn’t always so great, and there’s something to be said for helping your friends and family (even though that really does kind of stink a little). Jim Benton’s Clyde is now available for pre-order via online booksellers and comic book specialty retailers, and slated for release in February. The 104 page softcover graphic novel retails for $9.99. Yoe Books, in conjunction with IDW Publishing and Top Shelf, is overjoyed to announce a worthy title to its celebrated catalogue—Limbo Lounge by acclaimed illustrator Dave Calver. Spearheaded by multiple Eisner Award-winner, Craig Yoe, who guarantees this title will live up to their collections of stupendous comic art geniuses of the past, Limbo Lounge is already getting recognition across the comic book community, racking up positive review attention. An original graphic novel where newly dead people in Limbo await their fate at a bar while surrounded by bored interlopers from hell. This trippy, surreal, full-color adventure brings us from the hot, swirling sands of hell to the colorfully bizarre Limbo Lounge. Meet flower-headed freaks, Bud and Lou. Root for their new friend, a spry, elderly nun, Sister Eunice, as she works remotely in Limbo continuing to rid earth of despicable dirt bags. And, by all means, avoid the knife-wielding little pageant-princess-gone-bad as she plots for anything she can get at anyone’s expense. Reserve your copy of Limbo Lounge from Yoe Books today before it hits bookshelves 2/6/18! An original graphic novel where newly dead people in Limbo await their fate at a bar while surrounded by bored interlopers from hell. This trippy, surreal, full-color adventure brings us from the hot, swirling sands of hell to the colorfully bizarre Limbo Lounge. Meet flower-headed freaks, Bud and Lou. Root for their new friend, a spry, elderly nun, Sister Eunice, as she works remotely in Limbo continuing to rid earth of despicable dirt bags. And, by all means, avoid the knife-wielding little pageant-princess-gone-bad as she plots for anything she can get at anyone’s expense. The Limbo Lounge is the auspicious debut of a line of Yoe Books graphic novels. It’s Labor Day and lots of the GP team will be spending the day relaxing and having fun (we hope). We’ll still providing lots of news today! While you wait for things to kick off, here’s some news and reviews from around the web. 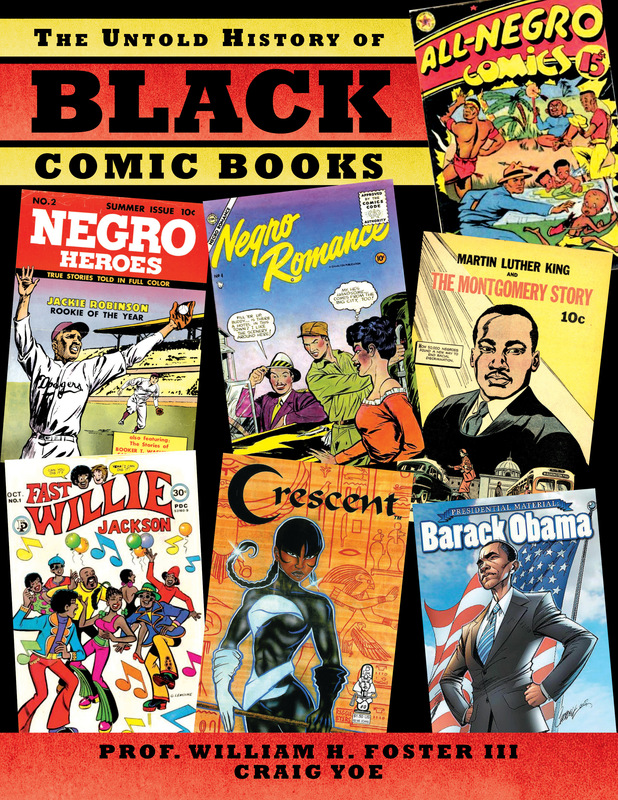 The Comics Journal – Yoe Books: A Disservice to Comics History – While there’s merit to this, maybe when doing hit pieces you should be transparent about who owns you aka a rival to Yoe? Transparency people! Nerdist – Yohance is the African Space Opera Comic You’ve Been Waiting For – This sounds pretty cool. CBLDF – Utah Judge Rules Against Speech-Chilling Liquor Law – Good. Daily Hive – ‘Deadpool 2’ shuts down Georgia Street to film stunt scenes (PHOTOS) – Some cool photos. Syracuse’s Salt City Comic-Con is welcoming Craig Yoe, and Yoe Books, to the growing guest list. The Eisner-Award winning archivist has been called “The Indiana Jones of comics historians” by Vice Magazine. His Yoe Books, an imprint of IDW Publishing, specializes in exposing a new generation to comics’ history in all genres –horror, superheroes, funny animals, satire and more. Syracuse’s Salt City Comic-Con, celebrating its fourth year, moves to the Oncenter’s War Memorial building in downtown Syracuse on June 24th and 25th. This pop-culture convention focuses on comics, toys, games, cosplay and collectibles. Pre-sale tickets are available online. To those to that know Milt Gross and his work, he is a legend among legends. For those that don’t, in 1930, Gross wrote and drew one of the very first graphic novels, the acclaimed He Done Her Wrong. Gross was also a popular comic-strip creator (with hilarious cartoon-style Yiddish-isms), novelist, produced animation (for Disney and MGM), and was a screenwriter (and co-writer of films with no less than Charlie Chaplin). 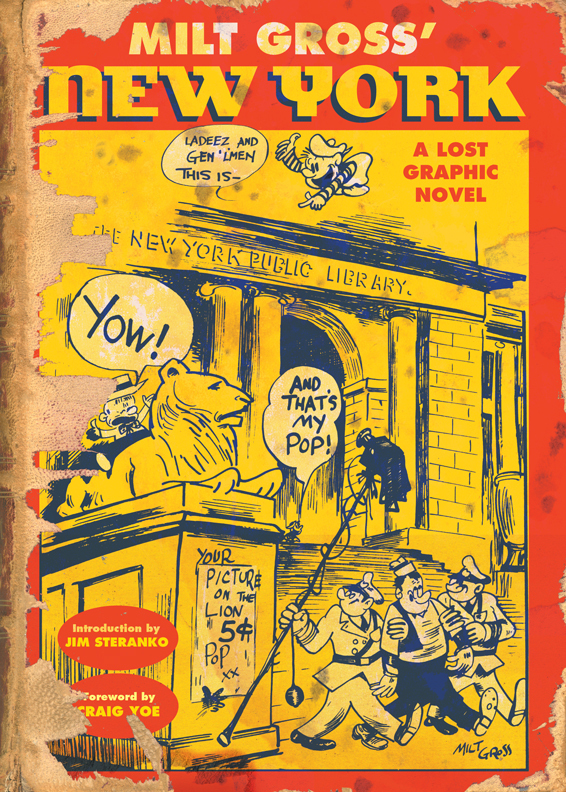 IDW Publishing and Yoe Books are releasing the “lost” graphic novel, Milt Gross’ New York, this December. In a mind-blowing, laugh-filled, freewheeling tour of New York, Gross’ character, Pop, and his sidekick son, blast through the East Side, the West Side, Chinatown, and Harlem. The demented duo roar through Yankee Stadium, the New York Public Library and Coney Island! This is really the Big Apple like you have never seen before and it’s all kinds of amazing! Here is your chance to experience one of the first and most brilliant graphic novelists’ work and just in time for the holidays.